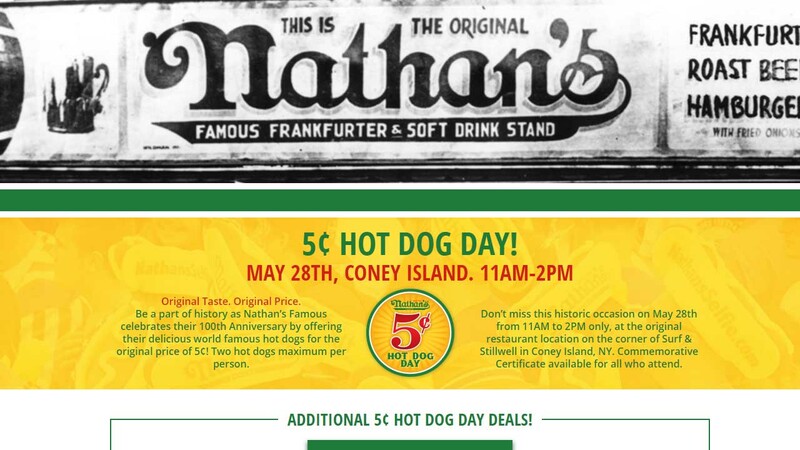 NEW YORK (WABC) -- Attention, weenie lovers: Get your buns to Coney Island today. In honor of its 100th anniversary, the original Nathan's Famous restaurant will sell hot dogs for 5 cents each between 11 a.m. and 2 p.m. Unlike Nathan's hot dog eating contest, participants are limited to two dogs per person, according to the company's website. The frugal festivity pays homage to history. In 1916, when Polish immigrant Nathan Handwerker opened his first Nathan's Famous stand on the corner of Surf and Stillwell, hot dogs sold for 5 cents a pop. One-hundred years and 435 million hot dogs later, the famous frankfurters now cost $4.25. During that time, the Brooklyn-born doggies solidified their stance as a New York City staple. Nathan's has served Yankees and Mets fans alike, as well as Al Capone and Eddie Cantor. Even Nelson Rockefeller, Former Governor of New York, is quoted saying "no man can hope to be elected in his state without being photographed eating a hot dog at Nathan's Famous."